“This is a game that flaunts a lot of bling - slick visuals, functional controls, challenging missions - and it far surpasses any previous effort at open world gameplay on iPhone. “ (PocketGamer. 8/10, Silver Award). 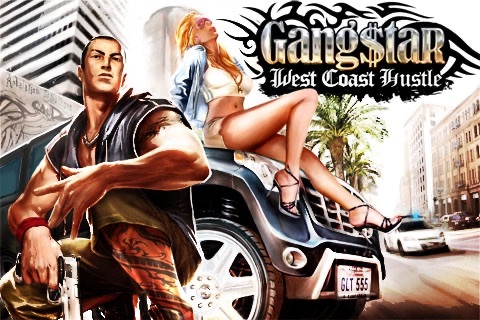 Move to the West Coast and immerse yourself in L.A. gang life with Gangstar. Explore more realistic environments than ever for a unique gameplay experience. Complete 50 different missions that combine the best of action games and driving games. - A unique feeling of freedom: Drive for miles and miles in massive, open-ended environments. Feel free to complete missions at your own pace, or just do absolutely anything you want! 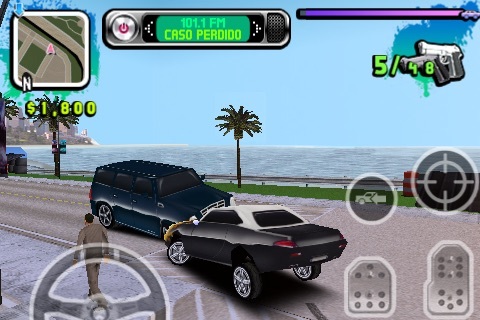 - The first iPhone game that displays such a high level of graphics: a full-3D reconstruction of an entire city with detailed buildings, beautiful landscapes and impressive cars that animate and take crash damage. - Get rich or die trying! 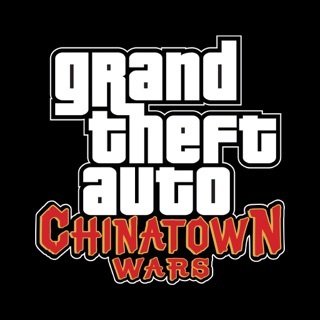 Explore the city, shoot and fight, steal vehicles, kill your enemies, and drive or walk anywhere. Go from rags to riches by connecting with relatives and helping out their gang. But beware of the police! - Intuitive gameplay: Drive a variety of vehicles easily thanks to touch controls, and aim at a target simply by touching it on the screen. Shooting sequences are even more enjoyable thanks to the auto-aiming system. - Be a Gangster your way. Choose your favorite radio station (hip-hop, rap, reggae, electro, Californian punk rock, etc), or listen to your own music stored on your iPhone! It's an okay game but I mean it could work on some stuff like jumping buttons (regular or over walls) and maybe better run animation. 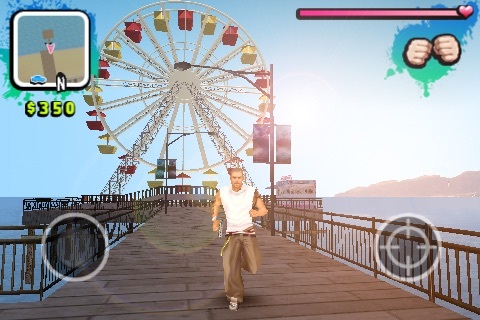 The main character in "Gangstar: West Coast Hustle", Pedro, looks like he just shat himself in the pants because he just can't believe he escaped the Mexican prison. Add more buttons in the game to make it better and not just run and shoot. Add more guns too, I like the simple bank of guns but it can have more like a regular guns store and a heavy weapons gun store. Try to think of ideas that are useful. After all you are a GTA clone so copy some ideas from them. Don't steal their own game ideas full but at least just part of it. Like the heavy weapons gun store can only be unlocked by doing all race mission or whatever crap there is. Fix the sound bug too. Plz make better vehicles, like planes, and plz make the guy stop running like he crapped himself. Also could you stop the sound glitch, and make better guns and a sprint icon so I can chase after cars and jump over walls and stuff. 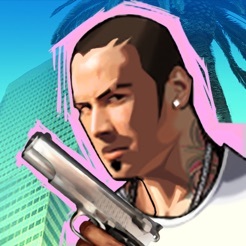 Plz make the graphics more realistic like gangstar rio and make it be able to turn night. Can u also add some guns like a flamethrower and a motercycle. Plz also make money harder to get. I have more ideas, but I can't think of them off the top of my head. 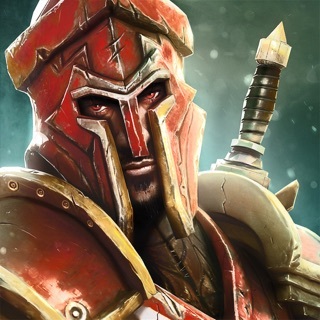 I liked all of your other games like Modern Combat 3: Fallen Nation, and Gangstar Rio: City of Saints, but this one is one of the worst. I will now rate 5🌟s over and over again. It is an alright game, but the graphics need work. Just because he's a gangster does not mean he can walk THROUGH trees. There should be more weapons, and it should have weapon upgrades. It's an okay game though, lots of cool missions, don't change that. But the steering in vehicles is incredibly hard because you barely lean it and it crashes into a wall. It's annoying. He needs to walk like a gangster, not like he just got probed. It is over priced, it is only a 2-3 dollar game at the most. But I do play it quite often and get in cop wars. That's always fun. If you want a game like this though, I would highly suggest downloading GTA 3 or GTA Vice City if you want a quality game for a lower price. It's alright, but there is a lot of room to improve.